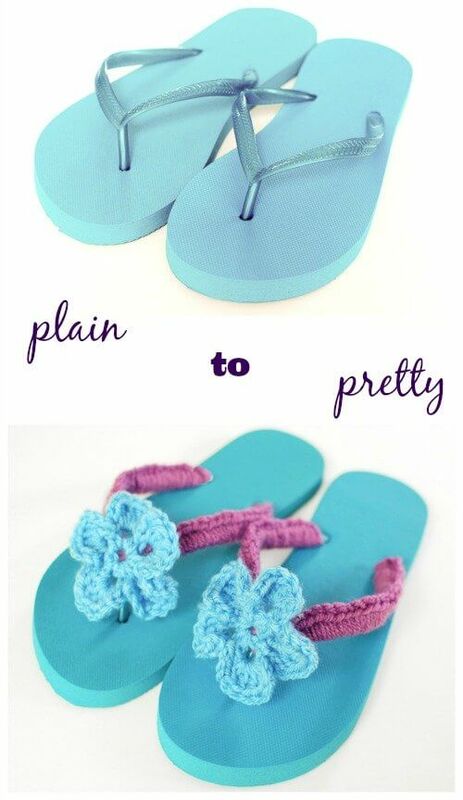 This crochet flip flops tutorial will guide you through transforming those plain inexpensive flip flops into a custom pair that is as unique and fabulous as you! You can find inexpensive flip flops at local pharmacy stores or even online, and then just grab some leftover yarn from your scrap pile and your hook and get started. This is a super quick project and you’ll be wearing your new flip flops in no time at all! To start, with the outer part of the flip flop facing you, wrap the yarn around the band of the flip flop with the tail end facing you and underneath the skein end, forming a loop (a). Insert your hook through the loop (b) and pull the yarn through (c). To begin crocheting around the band of the flip flop, insert your hook under the band, pull the yarn to the front and up to the top of the band, yarn over and pull through both loops (a). Continue crocheting across band, working over the tail as you go (b). When you reach the center, simply start again on the other side of the toe (a). Continue crocheting along other side until you reach the end of the band (b). Fasten off and weave in end (c). Ch 6, join in furthest chain from hook to form a ring. Round 1: Ch 1 (not a stitch), *work 1 sc in ring, ch 4, rep from * 4 more times, join in 1st sc of round — 5 ch-4 spaces. Round 2: Ch 3 (counts as dc here and throughout), work 5 dc in ch-4 space, ch 3, *Sl st in next sc, ch 3, 5 dc in ch-4 space, ch 3, rep from * 3 more times, join with a Sl st in same ch-4 space as last dc made. — 5 petals. Using a tapestry needle, sew flower to front of flip flop, as shown below. Tried it & love it! I found the first step to be easier to just tie on rather than trying to make loop. I also found my tension to be off but kept going and I think with practice and less tense it wil be better. I did finish one foot and am so proud. I love this pattern, but I’m having a lot of trouble getting the “tension” that you have in your stitches. Any ideas? (Hoping you’ll respond…you wrote this 6 years ago. Hi Tracey 🙂 Perhaps if you try a smaller hook size your tension will be tighter. #BestIdeaEver I think this is going to work really good for me. In the past I have not been able to wear flip flops, because I have tender skin and, the rubber always would leave in between my toes raw. So this will solve that problem and, I’ll be able to wear flip flops again! Thanks! Just tried these with some flips that irritated my feet. They are not only cute, but very comfy now! Plan to do this to all my flips! Thank you so much for sharing. I have 3 of those cheap FF and they always hurt me. I almost threw them away. Now I have an easy way to improve them. Nice job. quick to make. very cute. i made a pair today. These are so cute. Good job. I am going to try this for my granddaughters. Yay!! That makes me so happy to hear. So glad you like them!! I like this idea, however yarn gets sort of out of shape if you happened to get these wet. I have used nylon cord, found at any craft store by the yarn, I did mine in varigated colors, turned out great, even got a couple of requests for them. The nylon cord sounds like a great idea! hice las sandalias…la diadema y un adorno en pulsera a mi sobrina nieta…DIOS BENDICE A ESTAS PERSONAS Q COMPARTE SUS TRABAJOS CON AMOR…SI LA AYUDA DE ELLAS …NUNCA PODRIA YO APRENDER…. Kara, I’ve chosen this post as a featured post at Hookin On Hump Day! Just a friendly reminder to please link back to me to be featured. Thanks! What a great idea! I had never thought to crochet onto flip flops like this. Very creative and a great photo tutorial. Excellent job! Thanks for linking up at Hookin On Hump Day! Elles sont carrément craquantes, tes tonks!! très joiles, personnalisées à souhait! merci de nous montrer tous ces détails!! Thanks for asking. Monday Blues Inspiration is where or when I post anything blue that’s pretty or inspiring! Great idea – my niece would love these. I linked in spicy mince lettuce cups to Live.Laugh. Rowe’s linky party. Have a great week. Oh my how cute and clever!! I LOVE it!! Totally featuring this at our party tomorrow morning. BTW I LOVE your media buttons! Cute grannies! This is one of the cutest crochet ideas ever. Thanks for sharing at DIYbyDesign. I will be featuring this tonight at my Sizzle into Summer party (if you’re not okay with that, please let me know right away). Otherwise, please stop by and pick up an I’ve Been Featured button. Thanks so much. Oh my goodness. Cutest floppy floppies I have seen in a while! Nice job! These are adorable!! I want to try this for my daughter! Your Flip Flops are GORGEOUS!! !Saw it on Craft Junkie!!! VERY stylish!! I would gladly sport these! Great idea! And the flip flops look lovely and special! You know I love that turquoise color! What a great idea. I imagine having yarn against your skin is much less sticky than the plastic, plus it looks pretty. Amused that these are done in my school districts colors! Very cool! I love these and always love to have a good flower pattern. They come in handy for so many things. Very!!! Very!!! Cute! I’m going to try this on my daughters flip flops!! Great post! Thanks!